- Ryan Rockmore and Maria de Los Angeles present an innovative approach to the relationship between flamenco dancer and accessory. The five principal accessories - the castanets, bata de cola, shawl, fan, and cane - gain new meanings and roles as the dancers renegotiate how they are typically used. 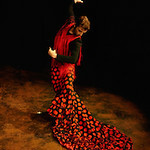 This experimental work brings a fresh perspective to the New York flamenco scene by New York artists. - A groundbreaking story written and performed by Barbra Herr about transgender womanhood. From a little bullied Boricua boy to blonde bombshell drag queen to outspoken trans activist: Barbra Herr still a late bloomer. After 25 long years of gender transition — the NYC nightlife legend is ready to be complete. Follow Barbra on her sometimes painful, often funny — but always honest — journey to sexual awakening in this compelling new one-woman show. Performed in English. 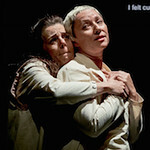 - A beautifully written play about the human relationship between two women forgotten by society. As they try to recover their past they discover that their love for each other was never lost. Winner of Best Production Award at Fuerza Fest 2016. Performed in Spanish with English supertitles.